Check out this beautiful used 88' Ferretti yacht for sale! 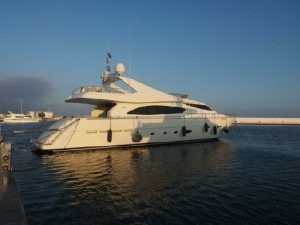 : Atlantic Yacht & Ship, Inc.
Word just came in from Brent de Sellier that he has listed an used 88′ Ferretti yacht for sale! In the first place, this sleek Ferretti yacht for sale was launched in 2005. Overall this yacht is in excellent condition and “turn key.” The current owner is the 2nd owner since new and has been professionally maintained. Moreover, this Ferretti yacht for sale has many desirable upgrades and features. Some of these include a flybridge jacuzzi, bow & stern thruster, ARG stabilizers, and a tender! This 88′ Ferretti yacht for sale is currently located in Italy and is VAT paid. Additionally she is powered by twin 2000 horse power MTU diesel engines. Furthermore, with only 1,350 hours she is ready to cruise with her next owner for years to come. She features four guest cabins and five bathrooms, not including crew accommodations. In summary, Furuno GPS / chart plotter and radar, Raymarine auto-pilot, and ShipMate VHF and whats on board. That is just a small sample! For more information on this sleek 88′ Ferretti yacht for sale be sure to contact Brent de Sellier today! This beautiful used 69′ Ferretti yacht for sale is available in Palm Beach!